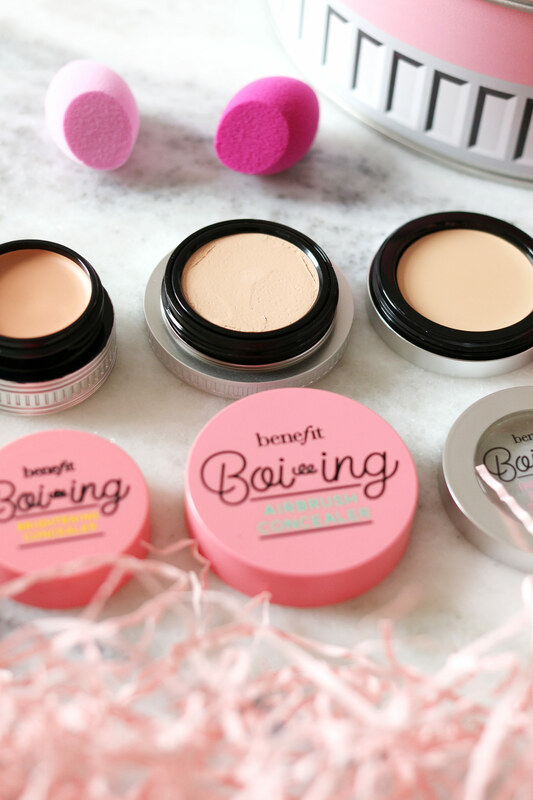 Benefit Boi-ing Airbrush Concealer | This has a slightly more whipped and light texture than the other three in tub format, but I really like that as it gives a diffused look when applied to the skin. It still offers great coverage and would be a perfect every day option for any complexion! Benefit Boi-ing Industrial Strength Concealer | This beauty is designed to cover everything from dark circles to blemishes to discolouration. It's (obviously) thicker than the others in the collection, but a little goes a long way with this one. I don't find it to be too dry either, which is a plus for a heavy concealer! Benefit Boi-ing Hydrating Concealer | One for those who want a bit of coverage, but have issues with drier skin. This concealer is housed inside a moisturising balm, so you get the best of both worlds. I like this one on any marks that haven't faded, as it gives just enough coverage for a minimal makeup day. Benefit Boi-ing Brightening Concealer | Another one for those with dark circles or tired eyes, the brightening concealer (formerly known as Erase Paste) has a slightly peachy-melon undertone so works to lift the eye and counteract the blue tones. I like to pat this on, wait for it to warm up and then lightly buff it in - goodbye dark circles!